Here comes another one of Fabergé's beautiful brooches! This one was made by workmaster Alfred Thielemann, sometime between the years 1904 - 1908. 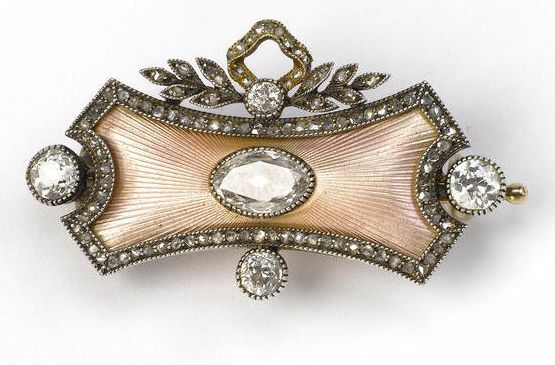 The convex-shaped brooch is covered in translucent pale pink enamel over a guilloché ground, framed by a row of rose-cut diamonds. Four circular-cut diamonds sits around the edges, and the piece is topped by a diamond-set tied spray of leaves. In the center of the brooch sits a large oval diamond. The width of the piece is 3.7 cm, and it was sold at Sotheby's.